I saw this massive wall-cling poster recently, and it reminded me that, for many students, work is not a choice but a necessity. Students who need to work in the summer to pay for school end up at a disadvantage because they take longer to complete college than those who don't need to work, delaying graduation, delaying a career, and increasing overall college costs. 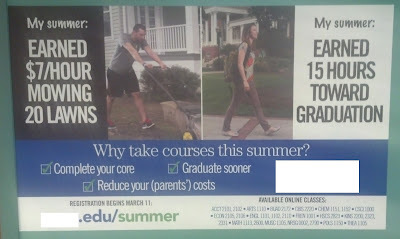 The sign also makes the assumption (albeit parenthetical) that parents are helping with college costs, an advantage not enjoyed by all students--particularly those who would need to work during the summer. Advertisements that frame summer classes in the language of "choice" do several things. First, they highlight what is likely the shortsightedness of well-intentioned administrators who do not recognize the diversity of students' socioeconomic situations. Second, they hide the fact that students are often structurally constrained. Finally, they alienate working- and lower-class students who are already underrepresented at most four-year institutions. And don't get me started on the push to online classes.